So the weekend before last I watched Frozen (and then pre-ordered it). I really liked it, apart from the great music, the interesting characters and the solid story there was one element in it that I liked more than anything else, and that's the main villain. I always like villains in Disney films, that's nothing new. Jafar, Scar, Hades, I really quite like the dark sides of the Disney movies. That said Frozen's real Villain, Prince Hans is one of the cleverest. Not his character exactly, but the writing of his character. He is exactly what a villain should be in my opinion. Hans, though? Hans you start off rooting for. 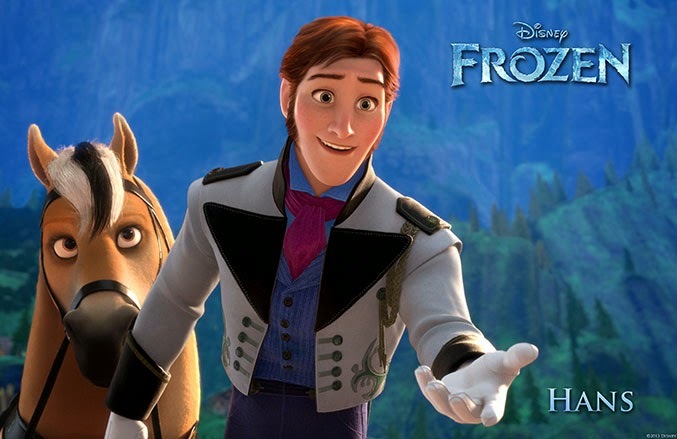 At the beginning and for a good long portion of the movie you want Anna and Hans to live happily ever after so when he eventually reveals his intentions and betrays Anna he betrays you, too. I love that, I loved not knowing who the villain was until the final few scenes. Real villains don't walk around with big signs on their fore heads saying 'I'm a villain' they act like the good guy until the end when they own everything and suddenly they're your slave master and you're toiling in the Lunar under mines. Think about it, really, if you were evil would you walk up to your intended target wearing dark clothes and tell them your evil or would you sidle up to them with a smile and stab them in the back while giving them a hug? Yeah, the latter. its easier and less risk that they'll shoot you first. and that's how Hans works. He wants to be king and so he makes everyone love him, then when he gets the opportunity he 'kills' Anna, captures Elsa and makes everyone think he got married and was now technically a grieving widower... who was King. I think it's one of the best villains in Disney and I wish he'd been around when we did the Stuff and Things Disney podcast because he pretty much tops the list.